To begin, why was the Atascadero Rotary Club was founded in here? Don: We started in Atascadero to do more good for the community. Our neighbors at the Paso Robles Club chartered and sponsored the founding of our club. They saw an opportunity for a service club like Rotary to grow in Atascadero. The more Rotary grows, the more good we can accomplish in communities both on a local and international scale. Ken: Rotary is all over the globe. Our focus on membership growth is why so many Rotary clubs partner with local high schools. We want to get as many people involved and doing acts of service as we can. That’s incredible that Rotary’s international. Going back to a more local scope, what’s your primary focus in Atascadero? Don: We are definitely youth focused. We have a Rotary Club called Interact that is specifically for high school students who want to get involved in serving with Rotary. Our high schoolers were a driving force behind the Atascadero Creek Clean-Up. To help serve our young people better Rotary also gives about $35,000 yearly in scholarships for high school graduates. These scholarships are good for four-year universities and technical schools. Working and serving the youth goes hand in hand with our mission.  In your own words, what’s the Atascadero Rotary Club’s mission? Don: To provide community support. This means supporting non-profits like ECHO, the Atascadero city, we were a part of the ice cream social at the zoo, and to do everything possible for our community. For example, every year our president picks a big community project for the Club to participate in. This year it’s Parents for Joy. Ken: Our motto is service above self. So, every mission and project taken on by our club is driven with that goal in mind. We have six areas of service defined. These are vocational, international, community, fellowship, club, and youth. 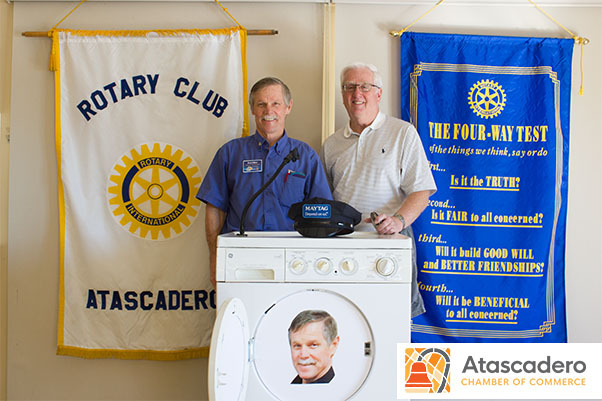 What are the benefits of joining the Atascadero Rotary Club? Don: If you want to be a part of something bigger and have an impact in the community than Rotary’s definitely for you. We have a 4-way test that we frequently refer back to. Is it fair to all concerned, will it build goodwill and better friendships, and will it be beneficial to all? Rotary’s also one of the best ways to network with other business members in the community. Our club supports each other, so those are some of the best connections you’ll make. 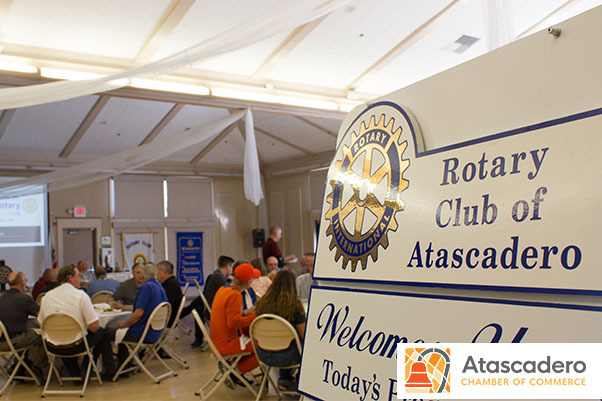 How can people join the Atascadero Rotary Club? Don: We meet at the pavilion at noon most Wednesdays for lunch and anyone’s welcome. Then we’ll follow up with you and help connect you with a sponsor to get you into the club. You can also reach out to us online, and we’ll try to get you connected. So, what’s it like to be the president of the Rotary Club? Don: It’s a full-time job. You have to be committed to growing the club and increasing the effectiveness of our efforts in the community. We go through a lot of training to make sure we’re as equipped as we can be to serve our members and community best. I keep hearing a lot about your Cork & Cap Fundraiser, what is that? Don: It’s a raffle to win either a kegerator with a keg of beer or a wine cooler with four cases of wine. There are a couple of other smaller prizes you could win as well. Tickets are only $10 and the drawing takes place November 14th! You can buy tickets at the Atascadero Chamber of Commerce, Idler’s Home, or find a Rotarian. Since all of the items were donated, all of the proceeds go back into helping fund scholarships and other community needs. Now that we’re wrapping up, what’s the one thing you’d like the community to know about the Atascadero Rotary Club? Ken: If you want to serve, Rotary is the place for you. Don: If our motto, service above self, resonates with you then you’ll fit right in with Rotary.